Western blot analysis of extracts from mouse and rat tissue using GAD1 (D1F2M) Rabbit mAb (upper) and B-Actin (D6A8) Rabbit mAb #8457 (lower). Immunoprecipitation of GAD1 protein from mouse brain tissue extracts. Lane 1 is 10% input, lane 2 is Rabbit (DA1E) mAb IgG XP® Isotype Control #3900, and lane 3 is GAD1 (D1F2M) Rabbit mAb. 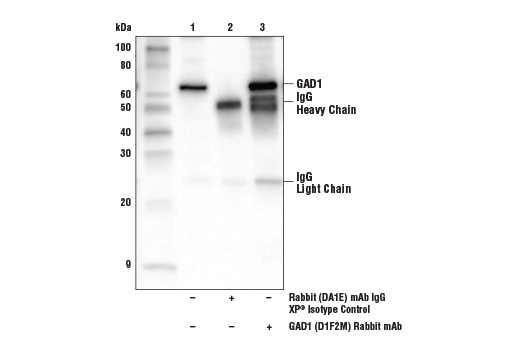 Western blot analysis was performed using GAD1 (D1F2M) Rabbit mAb. 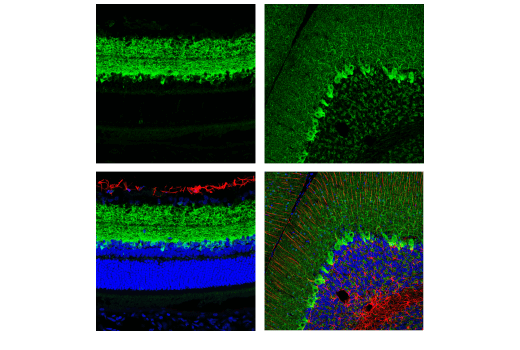 Confocal immunofluorescent analysis of rat retina (left) and cerebellum (right) using GAD1 (D1F2M) Rabbit mAb (green) and GFAP (GA5) Mouse mAb (Alexa Fluor® 555 Conjugate) #3656 (red). Samples were mounted in ProLong® Gold Antifade Reagent with DAPI #8961 (blue). 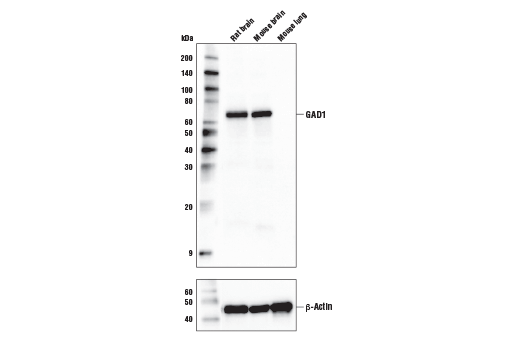 GAD1 (D1F2M) Rabbit mAb recognizes endogenous levels of total GAD1 protein. Monoclonal antibody is produced by immunizing animals with a synthetic peptide corresponding to residues surrounding Ala15 of human GAD1 protein. The enzyme glutamate decarboxylase (GAD) is responsible for the synthesis of the essential neurotransmitter gamma-aminobutyric acid (GABA) from L-glutamic acid (1). GAD1 (GAD67) and GAD2 (GAD65) are expressed in nervous and endocrine systems (2) and are thought to be involved in synaptic transmission (3) and insulin secretion (4), respectively. Autoantibodies against GAD2 may serve as markers for type I diabetes (5). Many individuals suffering from an adult onset disorder known as Stiff Person Syndrome (SPS) also express autoantibodies to GAD2 (6). GAD1 and GAD2 are encoded by separate genes and are coexpressed in most of the GABA-containing neurons (1, 7). Kaufman, D.L. et al. (1991) J Neurochem 56, 720-3. Feldblum, S. et al. (1993) J Neurosci Res 34, 689-706. Gao, B. and Moore, R.Y. (1996) J Biol Rhythms 11, 172-9. Rubi, B. et al. (2001) J Biol Chem 276, 36391-6. Gilliam, L.K. et al. (2004) Clin Exp Immunol 138, 337-41. Skorstad, G. et al. (2008) Eur J Neurol 15, 973-80. Erlander, M.G. et al. (1991) Neuron 7, 91-100.